Users receiving error code "#5.2.2 SMTP; 552 Requested mail action aborted: exceeded storage allocation> #SMTP#" when trying to send emails with attachments over 10mb. 1. 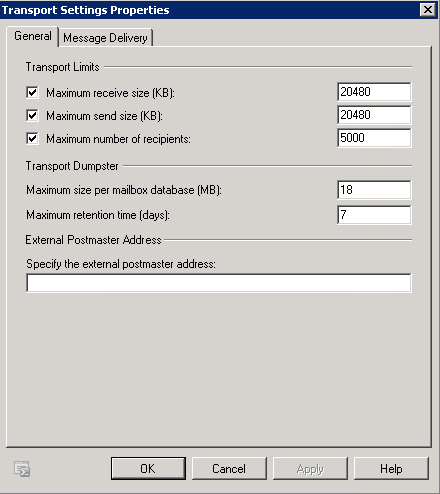 First check Exchange Server 2010 for send/receive limits. 2. Open Exchange Management Console on email server. 6. Check maximum receive and maximum send. In this case, mine was set to 20mb. 7. In this case, the Watchguard firewall was the culprit in rejecting the attachments. By default Watchguard sets attachment restrictions to 10mb. 8. To change the Watchguard Firewall settings. Log in and open the SMTP PROXY settings. Under General Settings category you will see "Set the maximum email size to", set this to preferred size. 9. Save policy to watchguard. 10. Test inbound email again to confirm.